July is the month of Omega’s Speedmaster watches. Not only the Moonlanding will be celebrated (on the 21th of July 2:56 GMT), also the last Apollo mission which dates back to July 1975 is celebrated. The ASTP (Apollo-Soyuz Test Project) consisted out of a number of joint scientific experiments, but was – of course – mainly meant to see whether combined (manned) missions between two super powers would be possible in the future. Mission ASTP started on the 15th of July and returned on the 24th of July 1975. Now, I think that my track record on blogging and writing about the Omega Speedmaster models is something I can be a bit proud of, but I never took the time to document the Apollo-Soyuz special editions. 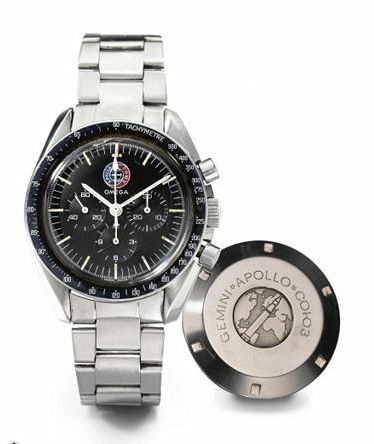 If you are looking for a story on the ‘actual’ moonwatches, please make sure to read my article on the Speedies that have been used during the moon landing on the 21st of July 1969 (you can find there articles here and here). As you can see, nothing much different from the original Moonwatch, except for the logo and the case back. The bracelet looks a bit like an Oyster bracelet from Rolex, but it is in fact an original Omega bracelet by the reference of 1168. This year, Omega commemorates the 35 anniversary of the combined space mission by another Speedmaster Professional Apollo Soyuz, ref. 311.30.42.30.99.001. An ‘ordinary’ stainless steel Moonwatch, but this time with an incredible looking dial made out of meteorite and a very impressive engraving in the case back of the watch. My friends over at Watch-Site (on-line dealer) lend me this amazing Speedmaster Pro Meteorite to play with and – of course – take some pictures of it. The cool thing about a meteorite dial is that no dial has the same structure. Of course, we’ve seen dials made out of meteorite before (like the Rolex Daytona as you can see here at Hodinkee) but this time it makes a bit more sense. 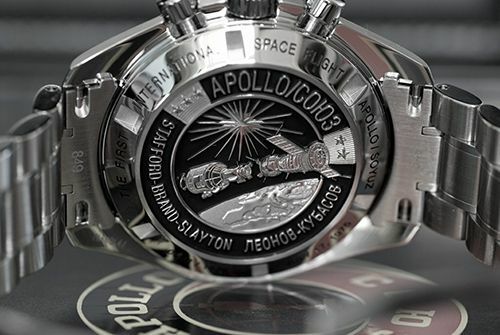 The case back of this Speedmaster Professional Apollo Soyuz, keeping the hand wound caliber 1861 safe and sound, has been engraved with the two space crafts from both the USA and the Sovjet Union and the names of the cosmonauts and astronauts involved (Alexey A. Leonov, Valery N. Kubasov, Thomas P. Stafford, Vance D. Brand and Donald K. Slayton). 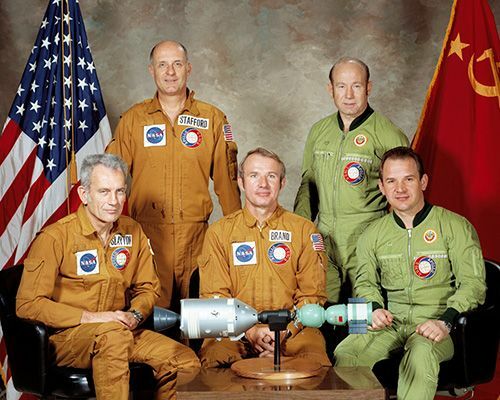 The two Apollo astronauts and the Soyuz cosmonaut on the front row are clearly wearing Omega Speedmaster watches on the picture above. At least I could identify them on the full size version of this picture, without a doubt. Below you can see the case back bearing the engraving of the space crafts as pictured above as a ‘model’ in front of the flight crew. 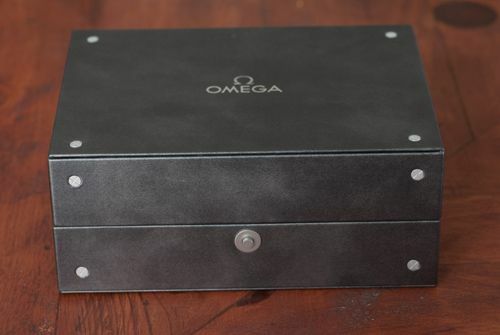 Omega really makes this Apolly-Soyuz or ‘Speedy Meteorite’ stand out from the regular models, the box has this meteorite colour and has a nice leather interior. 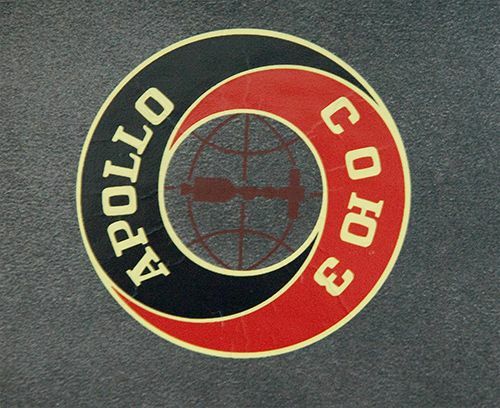 You need to push a button before the box will open, and then the watch is located on a leather pillow on the left and the Apollo-Soyuz emblem is located on the right part of the box. I didn’t photograph the white card board outer box, as you probably can imagine what it looks like. The booklet and papers of this watch are located in the card board box, as well as the certificate stating the unique number of the watch (of a total of 1975 pieces world wide). The watch wears very comfortable, and I actually find it more comfortable than the original Moonwatch with Hesalite crystal. I own a 145.012ST (caliber 321) from 1967 which weighs significantly less than this sapphire crystal model (the bracelet of the modern versions are also heavier of course). For the rest, the watch wears and behaves like any other similar Speedmaster model. The Lemania based movement is hand wound and based on the original 861 caliber (now 1861), which has proven itself over the years of its use (since 1968). The crown winds very easy and softly and the watch immediately starts to run. The chronograph uses this shuttle cam system (as opposed to a column wheel construction) and starts, stops and resets by pressing the buttons gently. After studying the watch for a couple of hours, I realized that I actually like the red printing, as well as the applied logo (old school style!). This watch could easily be mine, without a doubt. And its price? It lists for 6150 Euro here in The Netherlands (check your own local dealer for a price, although it probably does not differ much) which I think is quite steep for a Moonwatch with a meteorite dial. Does the 3000 Euro extra is justified for a special dial and engraving, limited to 1975 pieces? If you are a collector of Speedmasters, it probably is. Watch-Site offers this BNIB model for 5250 Euro which is already making it a bit easier to decide. One could say the regular ‘Moonwatch’ is priced below its real value, which I tend to under write. The regular ref. 3570.50.00 retails for just over 2700 Euro, with a Hesalite crystal that is. 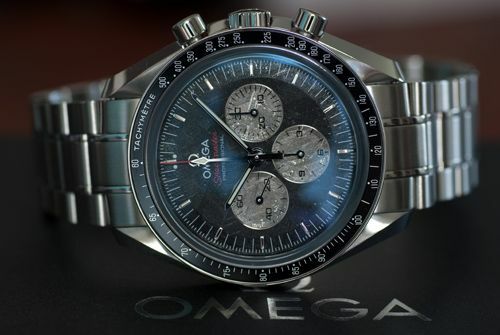 The Speedmaster is one of the most (or is it just the) iconic chronograph watches there is. In my opinion, it is even a more ‘clean’ and interesting chronograph than the famous Rolex Daytona. The classic design of the Speedmaster is impeccable and has proven itself for over 50 years now. 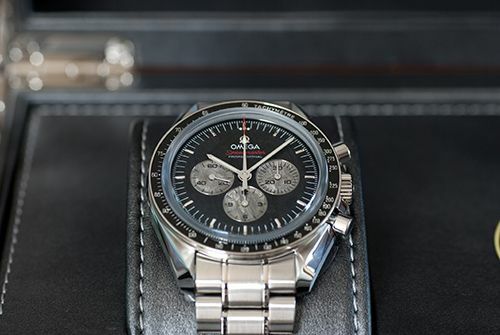 As I am writing this, I realize that I am trying to find enough arguments to justify the approximately 5K for this superb Speedmaster Pro ‘Meteorite’, but you know what? I don’t have to. It simply rocks. 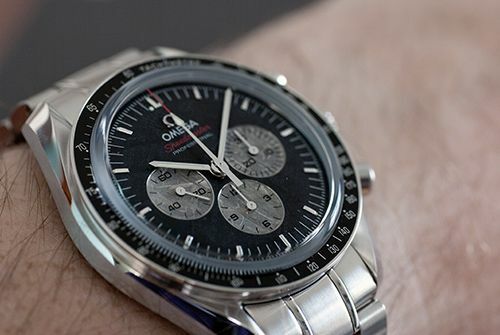 If you already have an Omega Speedmaster (pre-Professional) in your collection, make sure to wear it the next coming days.